Workplace safety standards continue to improve each year; however, today’s workplace, especially within a warehouse, can still include dangerous environments with many potential hazards and associated risks. Warehouse safety goes hand in hand with productivity. Lost workforce hours, damaged stock and machine repairs all eat away at the bottom line, so taking a serious approach to safety means much more than just making sure you are compliant. 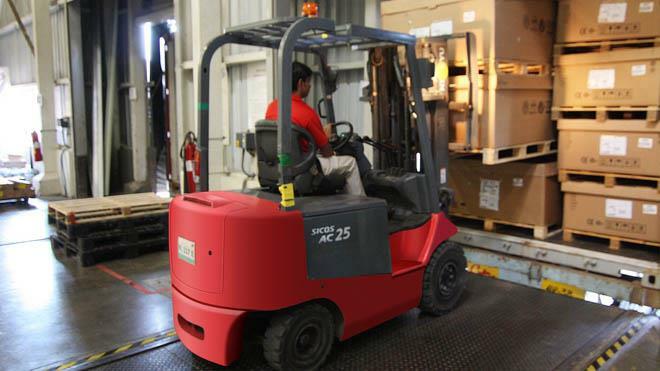 Forklift accidents are some of the most serious types of accidents in warehouses due to the sheer size of the vehicle and the fact that it operates in such close proximity to workers on foot. One simple mistake can be very dangerous. Drivers often become comfortable using forklifts, which in some cases can lead to carelessness. Forklift accidents come in two basic kinds: driving into something or mishandling materials. In the first instance, you may have a damaged forklift or damaged racking. The worst-case scenario is when a person has been hit, which of course can be a serious problem. Mishandling materials is usually the result of overstacking a forklift. This leads to damaged stock, high waste and a mobile hazard that could tip over at any moment in any place, endangering the driver and anyone else around the forklift. To reduce the chances of an accident, only trained employees should use forklifts. While some workers may think they know how to operate a forklift, if they are not trained, they should not be allowed to use this type of equipment. Operators who have received the proper training should be enrolled in refresher courses on a regular basis to avoid complacency and bad habits. Slips and trips are common concerns in warehouses, as liquids may be spilled, gravel can end up on the floor, debris can create risks, and boxes and pallets may be left in the wrong place. All of these can increase the risk of slips and falls. To avoid these hazards, make sure you have detailed procedures for where things go and what employees should do when a spill or similar issue is encountered. Personnel should also be appropriately attired, including the proper shoes. Floor tape can be used to identify potential hazards, while good lighting can improve visibility. Injuries resulting from workers attempting to lift heavy objects are the most common types of accidents after slips and trips. These injuries can occur suddenly or over a period of time and be disabling, affecting the back, shoulders and feet. Lower back pain is one of the most common warehouse injuries. Manual material handling, including order-picking and pallet-handling, leaves employees prone to injuries. It is estimated that back and shoulder pain makes up approximately 40 to 50 percent of all claims filed by warehouse workers. The risk is elevated when a person handles heavy loads. You can easily modify your warehouse to minimize such tasks. Provide proper training so workers lift items without risking injury. Also, never ask employees to lift anything that is too heavy, and ensure appropriate footwear is worn to avoid slips while lifting. Fire is one of the most serious threats to warehouse safety. Building permits, clearly marked exits, fire extinguishers and training are required in workplaces for a reason – to minimize the danger of fire. To prevent this major hazard, avoid exposed wires and cover them with nonflammable materials if necessary. Pay attention to any leaks, unidentified spills and gases that could ignite. If a fire hazard is detected, shut down the area immediately and report the problem to the warehouse manager, fire officer or safety officer. A common material-handling practice in warehouses is stacking objects on high platforms and shelves. As racks get higher, the risk of falling objects increases. Therefore, material must be fully secured, especially at higher elevations, and transported using stacker trucks or other appropriate tools. Secure racking can keep stock from being damaged and protect those underneath it. One of the first steps in avoiding warehouse accidents is understanding your local, state and national safety regulations. These laws not only are intended to keep you in compliance but also to help you maintain a safe working environment. Safety policies and guidelines should be made available to all staff members. Having a handbook readily available will keep safety guidelines at the forefront of people's minds and give them a reference point should they need it. Written policies also cover both employers and employees against accidents, claims and responsibilities. Using the wrong tool for any job presents a significant chance of injury. It is essential that anyone completing a job has the correct tool at hand and follows the proper procedure for use. Clear signage should be displayed throughout the warehouse indicating the potential hazards, correct personal protective equipment (PPE) for all hazardous areas and the actions that should be taken following an accident. Floor markings using colored tape can be useful in keeping walkways clear and for preventing workers with the wrong PPE from unknowingly entering an unsafe area. Taped areas can also help production in busy plants by marking specific waiting areas for part queues. Warehouse safety is an issue that affects all stakeholders, from board members to forklift operators. Not only is it critical to the wellness and productivity of your workers, but it also has a real impact on your bottom line. Produced in collaboration with PHL, a specialist plant machinery and forklift supplier.